Money in the Garage: Dear tire kicker - Mind your own beeswax ! Great post! I always tell the tire kickers that I have a strict policy to never end an auction early. As you said, if you've done your homework, stick to your price. If an item doesn't sell at auction, I will list it in my store, sometimes at a higher price, and wait for the right buyer. S/he will show up sooner or later. 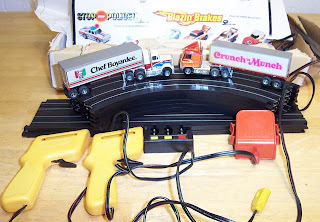 BTW, thanks for the tip on vintage slot cars! Haha that's so funny, just happened to me....I sell clothes and someone just a few days ago sent me an email saying, 'I can't believe you're selling those shorts for $20, that's about what they cost new!' I decided to just ignore someone who has nothing better to do than tell me my prices are too high for them. Funny thing is, the shorts sold the very next day! So I then emailed her back telling her that I was sorry, the shorts she had just inquired about had sold already. Lol. People are silly! Anonymous-Great story, people can be annoying can't they? Good for you on sticking to your price and letting that skeptic know it sold, that's awesome! Thank for checking in and come back again! Tire kickers are people who will go to examine a used car. They try to inventory every single defect on the car, and use the list of problems found to haggle for a lower price, usually claiming that the difference from the asking price will be used to fix the problems found.